During the course of this work, I try to explain how you can combine the rich tradition of Islamic teaching with beneficial contemporary scientific knowledge in order to lead a holistically healthy and happy life. The book is divided into five chapters, each concerning one of the five components that make up your body, mind and soul, clarifying in each chapter how to look after that part of you and keep it healthy. During the course of the book you will notice how these bodies are interconnected; the health of one is highly dependent on the wellbeing of the others, so that a happy, healthy life entails a balance between all of them. 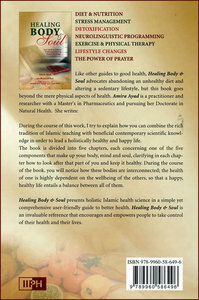 Healing Body & Soul presents holistic Islamic health science in a simple yet comprehensive user-friendly guide to better health. Healing Body& Soul is an invaluable reference that encourages and empowers people to take control of their health and their lives.